A greeting apart from brightening someone's day, can do many things, like helping two col-leagues to get to know each other, expressing one's care for another, or it can be the start of a fulfilling relationship. Greeting others is something common and yet important to all cultures. It is a norm that nearly everyone engages in on a daily basis. We greet people in different ways depending on our relationship with the person we are greeting and also depending on our culture. For example, for our business colleagues at work we usually greet with a handshake, a mother and child may greet with a hug or a husband and wife may greet with a kiss. We are taught these different greetings from childhood and most of us do not give any thought to the spiritual impact of how we greet. However, through spiritual research, we have found that different forms of greetings have different spiritual effects that can help or harm us in our daily lives and also in our spiritual journeys. This is because subtle energy is exchanged every time we greet others. In this section, we will cover in detail about how some greetings can be spiritual beneficial and some can be spiritually harmful. Nearly everyone greets someone daily. Each of these greetings has a spiritual impact that depends on our intention when greeting, who we greet and also on the type of greeting. 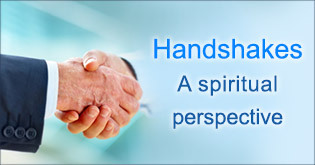 The handshake, which is a widely used greeting in the western world, can be done for a variety of reasons. For example, some may shake hands to develop rapport, some may do so to show authority, and some may do so as a mere formality. No matter what our intention is, shaking hands is very likely to have a negative spiritual impact that should be considered by all. One the face of it, the Japanese bow appears to be a very respectful greeting steeped in a rich cultural background. Yet even for this type of greeting, there are both positive and potentially negative spiritual effects. Who doesn't like the comfort of a warm hug from a person that we love? We also don't think twice about a social hug as it is now the widely accepted form of greeting. What most people don't realize is that a seemingly harmless hug has mostly negative spiritual repercussions. This is especially so when children are being hugged as they are more spiritually vulnerable. Along with a hug, a kiss on the cheek is more and more accepted as a social greeting. It is also one of the more intimate ways to greet others and it is common to many cultures.Many of us have been conditioned by movies, television and mainstream culture to see kissing in a positive light. Yet from a spiritual perspective, kissing actually has the most potential for exchange of black energy. For all the die hard romantics who hold a mouth to mouth kiss as the epitome of displaying romantic affection, the bitter truth is that it is also the form of greeting that can result in the most exchange of negative energy. Each greeting has a spiritual impact that depends on our intention when greeting, who we greet and also on the type of greeting. Shaking hands is very likely to have a negative spiritual impact that should be considered by all. From a spiritual perspective, kissing actually has the most potential for exchange of black energy. Greeting with Namaskar is the most spiritually pure form of greeting. Depending on one's attitude while performing Namaskar both the person being greeting and the one greeting can derive spiritual benefit. Praying before and during the greeting can help prevent negative energy from being exchanged. If we chant while greeting others, Divine energy helps protect us from negative energy. 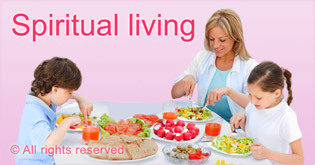 The choices we make in daily living impact us positively or negatively at a spiritual level. 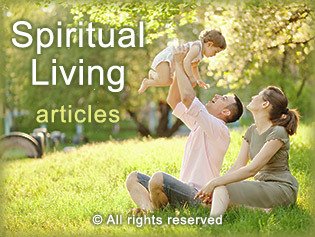 In this section, we present detailed information on life choices we can make to imbibe spiritual positivity. Lack of sleep affects everyone adversely. At the same time, restful sleep has just the opposite effect and rejuvenates and energises us in all aspects of life. 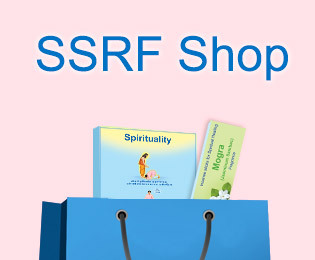 Taking some simple spiritual measures can result in improved sleep, which results in wide ranging benefits. 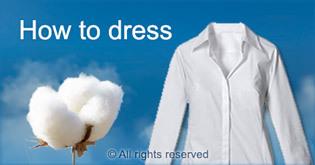 The way we dress is a result of many factors including style, convenience and social aspects. Most of us do not consider that the way we dress has a spiritual impact. Knowing how to dress to imbibe spiritual benefit can result in a positive boost to our daily lives and spiritual practice. 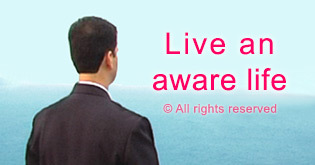 make decisions that lead to lasting happiness and Bliss if we are aware of it. 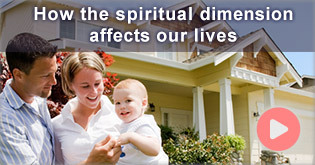 80% of the problems we face in life have their root cause in the spiritual dimension. This is why spiritual solutions are needed to our problems. 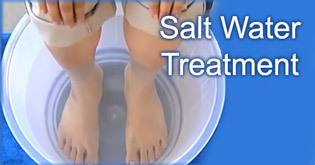 The salt water remedy removes any black energy accumulated throughout the day. Negative energy that we pick up by greeting others in a spiritually detrimental way can also be removed with the salt water remedy.